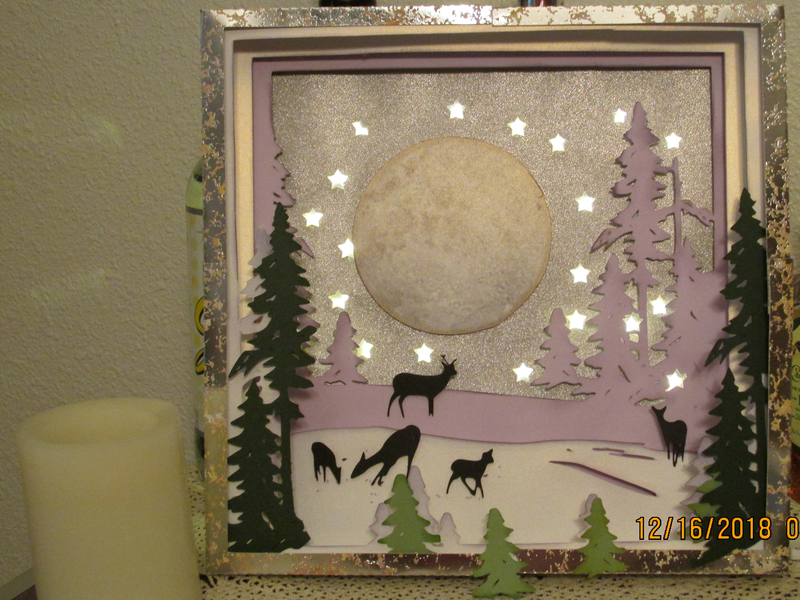 I also purchased the Bewitched Shadow Box from Dreaming Tree and liked it so much I made a similar one for Christmas. But the snow area and around the moon isn't lit up enough and the stars are too many and too bright. Need any ideas on how to make the moon and snow light up. Right now I like it better unlit. P. S. Don't look at the frame too closely. I didn't have a shadow box so made a frame out of mercury glass paper from Hobby Lobby and I guess I got the pieces mixed up because they didn't fit exactly. Also foreground trees are just glue-dotted on because I think I am going to have to take this apart. This is beautiful! What type of lights are you using. I find that the fairy lights are not as bright. They are 20 in a set (very tiny). I have used them on several pieces. You could try using vellum behind the stars. This would soften the brightness. Thanks @Penny. These are the fairy lights, a set of 20. And there is vellum behind the stars! I don't know why they seem so bright. It occurred to me today if I just run a row of lights behind the snow layer, and maybe above the moon, with no vellum, the light peak out behind where I want it to. That might do the trick. You may still need the vellum. could us and some sort of partitions so the were more light behind the area you want brighter and less in the other sections .. Does that make any sense ? @Crazy_Mr_Zing good idea about the plastic hanging around the house. Would be an easy thing to just add another layer behind the vellum. The construction is an accordion box so each layer is a half inch apart, except the moon which is just has some pop dots behind it. I don't know if I can stretch the lights underneath to make some of them fit behind the snow but worth a try because I don't like it as is. @Charo ; Yes it does - I made that one from Dreaming Tree. I forgot to mention that. Hopefully it will work for you.